Want a Box of Beautiful Surprises? VanityTrove.com & Singapore Giveaway! Don’t you hate it when you just want to try a product but you don’t want to spend a hundred bucks buying the full-size? Story of my life. Don’t you wish you could just get a sample of the product? Well, thankfully, there are now websites like VanityTrove that send you a series of samples every month to try to your pleasure. It allows you to try a range of products without dishing out the extra pennies so when they contacted me, I was happy to help them out to tell you more about this beautiful box of surprises. VanityTrove boasts a great concept. 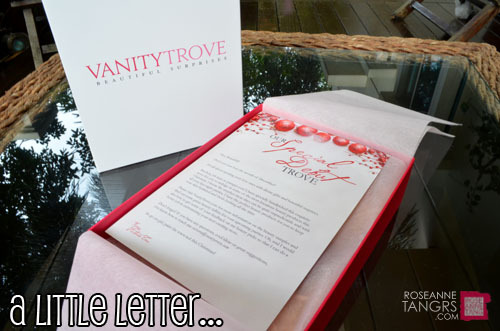 Once you choose from a monthly or yearly subscription, Vanity Trove will hand deliver you a series of samples in a themed box. Whether it’s December and the holiday season or February and Valentines Day, you’ll never know what they’ll send you next. These samples may be from yet to be discovered brands or timeless and cult classics! 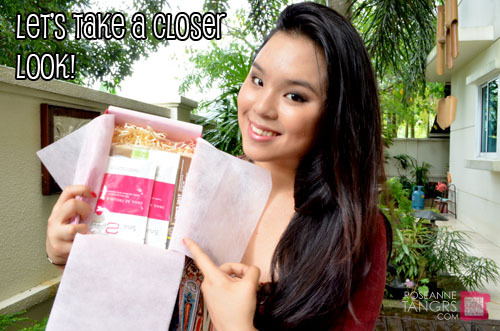 Nevertheless, they will send you 4-5 hand picked and deluxe sample size beauty products. You can also send these boxes as gifts to friends and family. They were nice enough to send me their December box so let’s open it up shall we? When you first open it up, you’re greeted with a nice letter from Vanity Trove describing the box. It’s like the Editor’s letter telling you about the theme. The December VanityTrove box is about pampering you with luxurious products this Christmas understanding that you’ll have those late night escapades and parties. 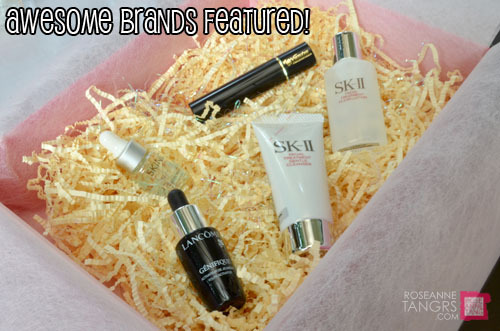 They’ve hand picked the perfect beauty products to keep your skin hydrated and fresh-looking all the time! 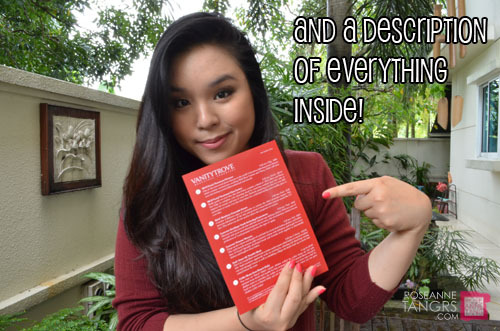 Each box comes with a list of products that they’ve included in the box and a description of why it’s in there – this is really useful if you have no idea what you’re looking at! It’s nice to see that they put in a good amount of thought into what they’re putting into the box as well. Well enough of the jibber jabber, let’s see what’s in the box! 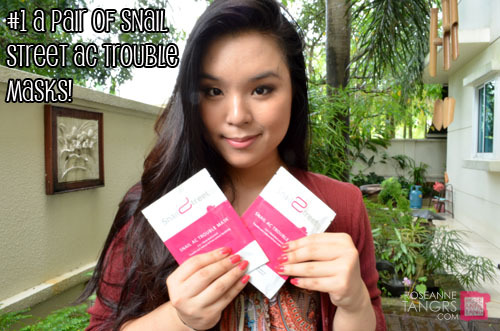 The 3 in 1 multi BioControl Mask contains snail extracts which helps to control troubled skin. 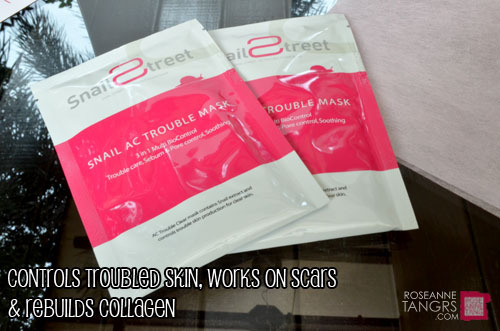 Snail secretions help work on scarring by softening and dissolving existing scar and damaged tissues and rebuilds collagen and elastin. If you have acne scars, then these masks are supposed to do you wonders if you’re brave enough to disregard the fact that they do contain a bit of escargot. A full size version of this baby with five sheets costs $32.90 but the box gives you two of them! I’ve always eyed that shop at the basement of ION that is SkinC and wondered what they’re all about. That shop is full of small little vials apparently and each vial does a different thing for your skin and provides a different supplement. You mix and match the supplements and basically customise your skin routine that way. Pretty interesting stuff and I look forward to putting this voucher into good use! It might be a little silly, but these coffee beans smell amazing. Call it my half satisfied coffee addiction but when you first open this box, the aroma of these coffee beans hits you like monday morning at the office. They’re organic, alkaline coffee beans that give a full bodied smooth flavour. 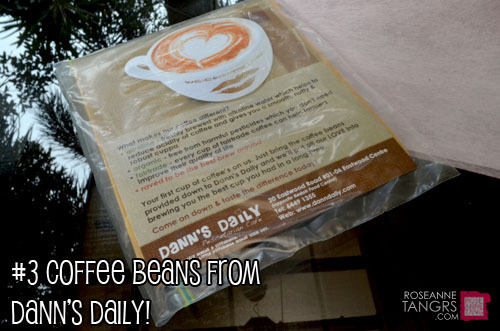 I reckon VanityTrove understands that we probably aren’t equipped to process these beans so if you bring these beans to Dann’s Daily, you can get a free cup of coffee. Their cupcakes are steamed as well. I was happy to see these two babies included! This is a cult product and has made me curious for too long. It contains AHA, BHA, and Pitera (the star of the show) to remove residual dead skin cells and improve the texture and tone of the skin. 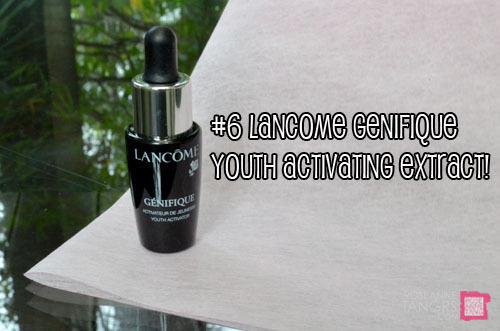 It prepares the skin for moisturiser and serum and gives the skin a healthy glow. A full size will set you back SGD $114. 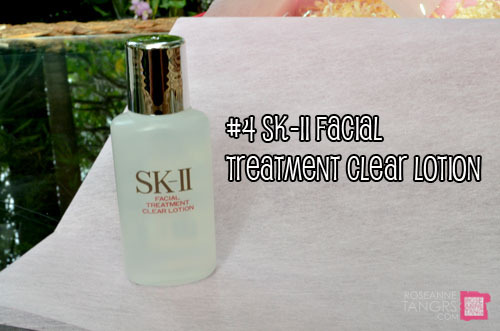 If the lotion isn’t enough, there’s always the facial treatment cleanser. This baby is one of the most raved about skin products in the world. It’s a very thick and luxurious cream cleanser that moisturises and soothes with Wild Rose Extract and Pitera. A full size is SGD$89 for 120g. 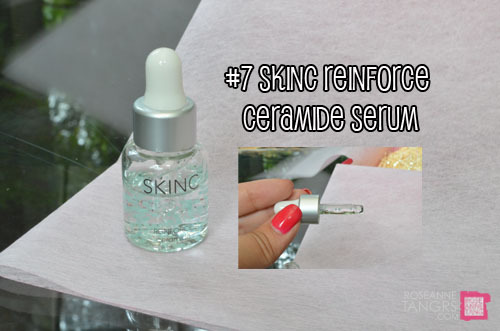 This little vial contains four different types of ceramides to enforce the skin’s protective barrier. This prevents dehydration of the skin and protects it from harmful environmental factors like UV rays and can even help with eczema! Cool beans. 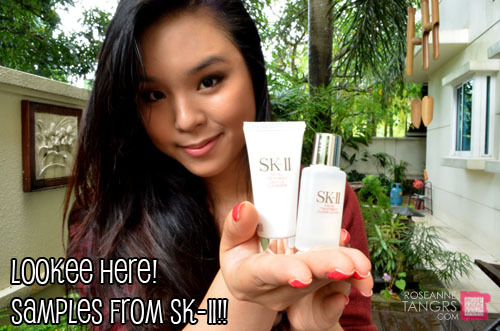 A full size is SGD$128 for 35 mL. I’m excited about this one! 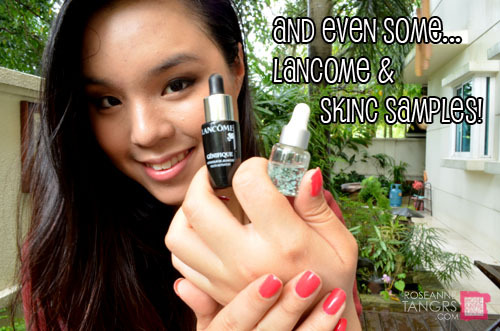 I’ve heard so much about Lancome mascaras. This is supposed to help with volume and length for a bolder look while helping with definition for 12 hours. The brush and formula work together to dramatically thicken and lengthen lashes! 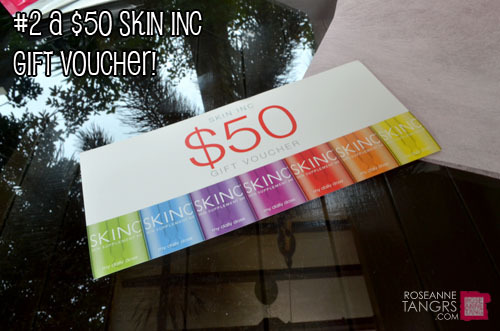 A full-size is SGD$50! And there we have it! I have to say that VanityTrove picked some awesome high-end brands to try out that I would have never tried out. 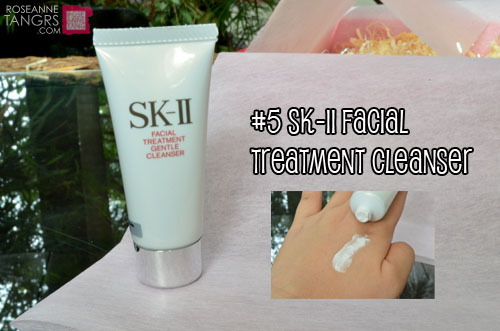 Despite wanting to try the SK-II Facial Treatment Lotion, I probably wouldn’t be able to fork out S$114 for something that I haven’t tried out and that may or may not work out. This service is pretty nifty for people like me actually. And it’s time for a Giveaway! 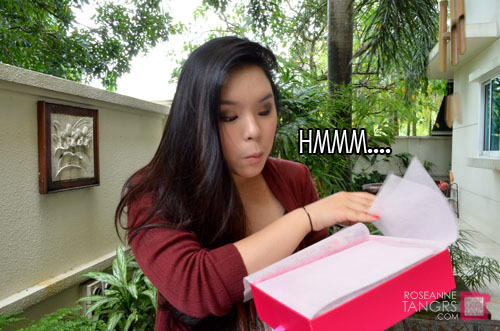 VanityTrove was nice enough to sponsor three boxes for three of you in Singapore only. 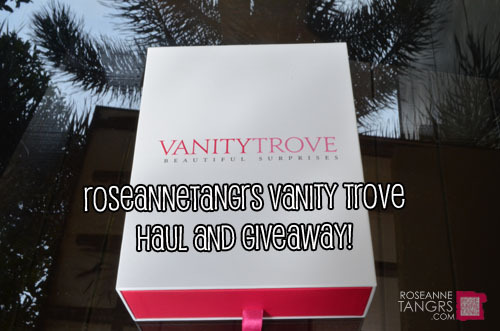 I’m sorry that this giveaway is not open for readers outside of Singapore because VanityTrove is currently a Singapore only service for the time being but wishes to expand outwards later on. Don’t worry, you know I have so many giveaways it’s getting ridiculous. But if you are from Singapore, then hear ye! Giveaway Details (Ends Jan. 10, 2012) THE GIVEAWAY IS NOW CLOSED!! Good Luck!! Thank you to VanityTrove for sponsoring this post, do visit www.vanitytrove.com for more details and to sign up for your own boxes hand delivered right to your home! They send out the boxes on the 15th of every month and you will receive it in 3-4 days with the last day to register being on the 14th! It costs SGD $25 a month and subscribers can cancel anytime they want to! To keep in the loop, be sure to join their FB page at http://www.facebook.com/vanitytrove.com for promotions, events and exclusives! I love the month December cause its the only time my grandpa comes down to visit us. 1. I love the month of december cause that’s when I can enjoy all the yummy Xmas food. I love the month of dec as it’ll be e time when my extended family will meet up. I felt that time is v precious esp spending time w your family as I’m a healthcare worker. Life is short, spend w/o regrets, live to e fullest. 1. November. It’s my wedding anniversary, birthday, and the month that my husband started courting me! 1. I love the month of January because it’s my birthday month and it’s CNY this year! I get to see relatives I don’t meet so often! Yeah! 1. I love march as my mom and I are born on that month! What’s more we are only 10 days apart so we often celebrated it together. 1. I love the month of April because it’s my birthday month! 1. Hi..my fav month is november coz its my bday month and holiday mood starts to set in to everyone! 1. My favourite month is December because it is the month I was born and also it has always been a great month every year, full of happiness and joy! 1.My favourite of the month will be October as its my Wedding Anniversary Day! Its an unforgettable day for us! 1. I love January! Because I am born on the first day of Jan! 1. My favourite month is June! I’ve got great memories of long holidays overseas, the general buzz of summer and lots of free time because of school holidays plus great makeup and clothes collections that are most appropriate for Singapore’s weather. Plus the weather’s usually good in June without too many rainy days. 1. My favourite month is November because it’s my wedding anniversary and filled with wonderful memories. 1.My fave month is June cos it’s always holidays and my birthday falls on 5th june too! I love the month of January because it promises new hopes, new beginning and new opportunities for all! 1. I love the month of January as it is the start of another semester and another year of fun blogging:) Well, it is also the month of gathering where most of my friends get together for fun chats and gatherings. 1. I love the month December because that’s when there’s sales everywhere! 1. My favourite month would have to be november. One year older, one year wiser! It always give me a nice heartwarming feeling when my close friends and family take time off their busy schedules and celebrate my birthday, even if it is a just simple dinner. Favourite month for me is MAY! Because it’s the month before my birthday and the birthdays of my closest friends! Thank you Roseanne for another awesome giveaway! 1. I love end November. I love it for it’s comfy cool weather when I travel overseas. I love it for the on-coming festive season, the getting of gifts and the meet ups with “let’s not wait till Christmas” excuses (more food!). And I love it that everyone is generally in a happier mood because of things to look forward to (annual leaves, celebrations, preparation process, etc). 1. August, because I’m a Leo, baby! 😉 Several of my friends are also bron in August, so it’s always a wonderful month of receiving and giving presents! eventhough the weather is cold and rainy. 1. I love the month of March because i have my birthday and , my hubby and I , always to go to a hotel for a weekend break ! My favourite month is January! Coz that’s my anniversary month with my bf. The month of October because is my son’s birthday then. my favourite month has to be december, the atmosphere just seems merrier and life slows down. though the weather cools the heart warms up to the feel of christmas. as we look back wistfully on the events of the year, we must remember that the end of a year also marks a new beginning of hope. 1. I love the month of February because Chinese New Year usually takes place in February! And I love Chinese New Year because I get to visit so many of my relatives and get red packets too. 1. My favourite month is January. It represents a ‘brand new start’ to me n it’s my birth month. January is when I feel all motivated to do all the things I failed in the prev yr & improve all r/s.. It makes me feel that I have ‘grown’ because I’ve learnt so much in the prev yr!! It feels good to be in January because all the bad memories is gone with the prev yr. Sorry fr the double post!!! I just realised its singapore only. LOL. Dw my entry 🙂 Sorry ! 1. I love December! I have 2 months worth of school holidays! And the weather in Singapore is so much cooler than the rest of the year. I wouldn’t say July is my favourite month although it is my birthday cause I will grow older! 1. I love the month of December because it’s when my favourite holiday Christmas is. It also heralds the coming of my other favourite holiday Chinese New Year. 1. My favorite month of the year is January. I really hope I win, I never have luck with giveaways and can’t really afford high-end products. My fav month of the year is Jan because its my birthday month and it is also a new start for me. 1. I love the month of december because there is so much happening! There is christmas which is my favourite holiday and new year! 1. I love January because it’s the start of the year and also my birthday month! 1. I love the month of December because it puts everyone in a festive and giving mood. It’s a time for gatherings, and it is also a timely reminder to cherish such special moments with family and friends. 1.I love the month of May as it usually means exam time, but it also implies that holiday is coming in June! 🙂 we study hard, but we play hard later too, isn’t it! 1. I loveeee Dec for all the festive season & food! 😀 Gotta wait another year for Dec again! 1. I love the month of Dec because it’s the holiday season with loads of gifts, food and beauty limited edition products! 1. My favourite month…?? DECEMBER…. I JUST PARTY ALL DAY!!! 1. I love the month of December because it’s holiday season and i enjoy GIVING particularly to share joy with people around us. Thanks for always sharing your blessings..
1. I love December because I love the warm Christmas feeling and it’s when school’s out! 1. My favourite month would probably be November. Its when the school term finally ends and I have 2 months to look forward to before next year. Plus, its when the sales come out and I can go shopping! 1. I love the month of July because it’s my birthday month and it’s one of the sunniest months in the year. my favourite month is may because that is my birthday month where i can get presents and lots of birthday treats. 1. I simply love the month of decemeber as there’s so much of pretty decor everywhere in town and the festive mood of gifting is amazing! 1. i like the month of June because it is my birthday and school holiday. Thats the time when My family had a numerous gathering and spend crazy time together! 1. I like the month of January because it’s a start of a new year which means it’s another chance for me to begin a new hobby. 1. I like the month of November because not only does it mark the beginning of the festive season, but it’s also my birthday month! 1. My favorite month is August because I love the fall and the weather settling down, but it hasn’t been too chilly yet! Also I love the start of school, oddly enough. 1. My favorite month is August because besides, being my birthday and anniversary and National Day, the weather is at its best this time of the year. 1. I love the month of September as my uncle, granddad, aunt, cousin, bestfriend and my birthday falls 1 after the other.. A reason to get together and celebrate..
1. my favourite month is april because my birthday falls in that month. it’s also my boyfriend’s birthday month since his birthday is 2 days after mine so april is really a time i look forward to celebrate our lives together. 1. December! Because it is Christmas time and the holiday time! Love the spirit of the holiday everywhere! 1. I LOVE the month of January, simply because it’s the first month of every year. It’s a fresh start for everyone, every year! 1. My favorite month is December cos you can simply feel the festive atmosphere by walking down Orchard road plus that’s when all the Xmas sets are out …. hee hee. My favourite month is November because it rains alot tin Nov and I love the rain! 1) I LOVEE NOVEMBER CAUSE WELL, FIRSTLY ITS MY BIRTHDAY!! second because school ends during that time of month ! 1. My favorite month is January since it is the start of a new year and for more opportunities to come. Additionally it is my birthday 🙂 and my other half’s too!! So its a month full of celebrations and basically love. 1. i love december because it’s a time for celebration. it’s also when everything winds down in anticipation of the new year. 1.I love the month of December because it’s always a month filled with joy and happiness where u finally get to have a good holiday spent with family and parents! & not forgetting Christmas where the joy of giving spreads among ppl from all walks of life. 1. I love the month of January or February, depending on which month Chinese New Year falls in! It’s the month of the year where I eat without thinking of the consequences. LOL! 1. I love the month of december & april cause December it’s my birthday & april is the month where i fall in love. :) years ago with my bf. 1. my favourite month would be December, where X’mas is! i love receiving presents, but it’s awesome to give presents as well! it’s a wonderful way to end the year. The giveaway is now closed! Entries from this point onwards will not be valid! Good luck everyone! I really want to join vanitytrove..